This micromosaic depicts Romulus and Remus, the legendary founders of Rome, who were rescued as infants from the River Tiber by a she-wolf. The wolf raised them until they were found by the shepherd Faustulus. It has been set into the clasp of a wide bracelet made of woven hair. Wide bracelets, often several worn together on one wrist, became fashionable in the 1820s. A chased gold clasp inset with an eight-sided mosaic depicting Romulus and Remus with the wolf in a malachite surround, affixed to a band of woven hair. Historical significance: Two other Gilbert micromosaics illustrate the same subject. Loan: Gilbert.206:1-2008, a plaque, which is shown in an adjacent drawer. Romulus and Remus were the twin sons of Mars, god of war, and a vestal virgin, who accused Mars of violating her. She was thrown into prison and her sons were ordered to be drowned in the Tiber. They survived and were reared by a she-wolf as shown in the micromosacis plaque on this bracelet. Romulus became the legendary founder of Rome. 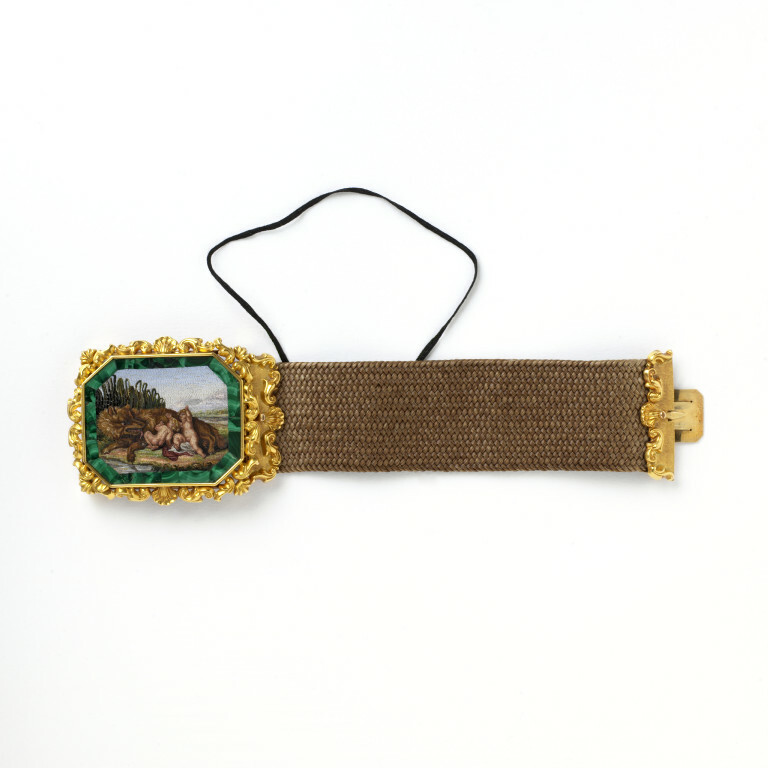 Bracelet with Romulus and Remus, Rome, 1820-50. Gabriel, Jeanette Hanisee with contributions by Anna Maria Massinelli and essays by Judy Rudoe and Massimo Alfieri. Micromosaics: The Gilbert Collection. London: Philip Wilson Publishers Ltd. in association with The Gilbert Collection, 2000. 310 p., ill. Cat. no. 175, p. 239. ISBN 0856675113. Gonzalez-Palacios, Alvar. The Art of Mosaics: Selections from the Gilbert Collection, Los Angeles (Los Angeles County Museum of Art) 1977. 143 p., ill. Cat. no. 70. ISBN 0875870805. Avery, Charles, assisted by Arthur Emperatori. Mosaics from the Gilbert Collection: summary catalogue. Exhibition catalogue Victoria & Albert Museum. London: H.M.S.O. 1975, cat. no. 57. Wide bracelets became fashionable in the 1820s. Several were often worn together on one wrist. This one depicts Romulus and Remus, the legendary founders of Rome, who were rescued as infants from the river Tiber by a female wolf. The wolf raised the twins until they were discovered by the shepherd Faustulus.